Contents: Introduction: urban resilience efforts in the face of natural disasters, Pierre Filion, Mark Skidmore and Gary Sands; Enhancing hazard resilience among impoverished urban communities in Ghana: the role of women as catalysts for improvement, Robin L. Ersing, Osman Alhassan, Jesse Sey Ayivor and Kiki Caruson; An analysis of governmental performance during urban disasters: Fukushima and Hurricane Sandy, Saundra K. Schneider and Marty P. Jordan; Urban disaster recovery: considerations for damage reduction and sustainability, Zhila Pooyan; The earthquakes in Lisbon (1755) and Angra do Heroismo (1980): reconstruction processes and actual risk, Artur Feio, Roberto Bologna, Daniel Monteiro and Daniel Felix; From disaster to opportunity: reviving urban function after the Canterbury earthquakes, Joanne Stevenson, Sonia Giovinazzi, Erica Seville, Charlotte Brown, Yan (Alice) Chang-Richards and Suzanne Wilkinson; Adaptive strategies of urban disaster recovery planning, Mark Kammerbauer; Urban vulnerability and resiliency to natural disasters: an integrative tourism planning perspective, Hyun Kim and David W. Marcouiller; Computing the aggregate cost of a disaster: national and regional issues, Charles Steindel; Conclusion: stages and scales of urban resilience strategies, Gary Sands, Pierre Filion and Mark Skidmore; Index. 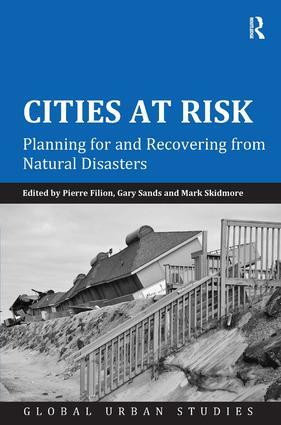 Pierre Filion is Professor of Urban Planning at the University of Waterloo in Ontario Canada. Gary Sands is Professor Emeritus of Urban Planning at Wayne State University in Detroit. Mark Skidmore is Professor of Economics at Michigan State University where he holds the Morris Chair in State and Local Government Finance.